Jonathan Musk finds out if Volvo’s new crossover lives up to the hype. Volvo has completed its global SUV line up with the XC40, following in the footsteps of its bigger brothers, the XC60 and XC90. The new car is the first to be based on Volvo’s latest Compact Modular Architecture (CMA), also destined for the next V40. A comprehensive range of petrol (T3, T4 & T5) and diesel (D3 & D4) engines with combinations of front- or all-wheel drive setups and 6-speed manual or 8-speed automatic gearboxes are available. The 148bhp D3 diesel FWD manual is the expected fleet best seller, offering 127g/km CO2 and a BiK value of 27%. Opt for the auto and CO2 rises to 132g/km and BiK one percentage point. Following Volvo’s vision of an electrified future, a three-cylinder petrol using 48V mild hybrid technology and a battery electric version will be added, likely in 2019. And, Fleet World can confirm that the electric variant will be equipped with a “frunk”: storage under the bonnet where the internal combustion engine is usually found. Equipment trim levels include Momentum and R-Design, with Inscription and pro models being offered later. “Pro” trims are standard specifications with the most popular add-ons included, designed specifically for fleets that don’t usually offer options. Eager beavers can opt for XC40 First Editions based on an R-Design Pro trim and additional paraphernalia including Pilot Assist, a powered tailgate and premium Harman Kardon speaker system. The car’s design is a joyous blend of curves (in all the right places) and straight-cut lines that add a subtle determination. However, the car’s interior is the raison d’être with clever storage options like a removable bin, acres of space and clever luggage solutions. Materials are suitably premium and sensible use of insulation have ensured the cabin is masterfully quiet no matter what the outside environment. Volvo has been generous with standard equipment on the XC40: LED headlights, ‘lifetime’ sat nav updates and a raft of safety technology including City Safety (that detects vehicles, pedestrians, cyclists and large animals), Oncoming Lane Mitigation and Run-off Road Mitigation & Protection to name but a few. 18 inch alloys and a 360-degree parking camera are also standard, as are the driver’s customisable 12.3 inch instrument display and centrally mounted 9.0-inch touchscreen. The latter includes often premium features like Apple CarPlay and Android Auto and is the same unit found in the more upmarket XC90. However, unlike Volvo’s larger cars, semi-autonomous safety systems like Pilot Assist, which includes lane keeping assistance, and Adaptive Cruise Control are available as options. Overall, it’s a comprehensive feature set that helps justify Volvo’s high-at-first-glance asking price. Prices start at just under £28,000 with lease options available from £280/month. Volvo has also introduced ‘Care by Volvo’, whereby a monthly sum of £629 (on a 24-month contract) will see an XC40 T5 or D4 ‘special’ Momentum spec sat on your drive, which includes insurance, maintenance, tax and requires no deposit. The price may seem steep, but consider your usage and this could calculate as favourable for some. UK customers can expect delivery from March 2018. On the road, it’s clear Volvo has catered the XC40 more towards relaxed driving and its featherweight steering and reasonably soft suspension setup alleviated the stress of Barcelona’s inner-city traffic with ease. The car’s height and weight certainly don’t do it any dynamic favours, but this is the true genius of this car. Volvo appears to have sussed who is likely to buy it and realise that Nürburgring tuning is definitely not what its customers want. XC40 ‘Pro’ trims include popular extras for fleet buyers. 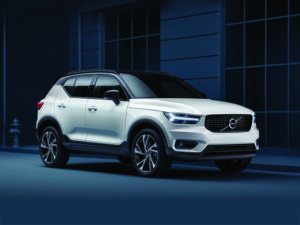 The XC40 D3 FWD will be available from £259 per month with a P11D value of £28,750. Residual values are expected to be higher for XC40 than its chief rivals. Safety equipment as standard is high, but semi-autonomous options are available. The XC40 is good enough to fend off not only competition from established rivals like the Audi Q3 and BMW X1, but newcomers like the Jaguar E-Pace. It’s a class-leader.